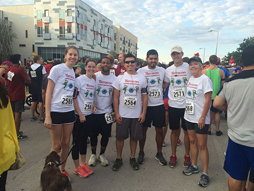 Employees in the Austin office participated in the the 2015 CASA Superhero 5K Run recently. The team helped to raise more than $55,000 for abused and neglected children throughout the Greater Austin area. The Terracon team had some custom t-shirts made to help us represent our great company. Case Appointed Special Advocates (CASA) speaks up for children who’ve been abused or neglected by empowering community volunteers to be advocates for them in the court system. The organization has grown to 933 CASA and guardian programs in 49 states.